Tow Trucks Available 24/7–Nights, Weekends & Holidays! Roy Rogers Body Shop is the best source for any towing needs 24/7. We are always available, including nights, weekends, and holidays! Contact us at any time and we’ll help with everything from lockouts, tire changes, jump starts, and more. Our professional Laurel vehicle towing service staff will arrive promptly to help you. Of course, we can also tow your vehicle wherever it needs to go. We tow cars, trucks, SUVs, and much more. If you need collision repair, we’ll be glad to tow any vehicle to our auto body repair center. Our friendly ASE and I-Car Certified collision repair experts will take care of your vehicle’s needs. We respond to any car troubles, including vehicle collisions, breakdowns, lockouts, and more. All of these will make for a stress-filled day or night, but we’re here to make them as stress-free as possible. When a customer calls for towing service, it’s usually after an emergency. Vehicle collisions qualify as such but that’s not all we handle for our customers. 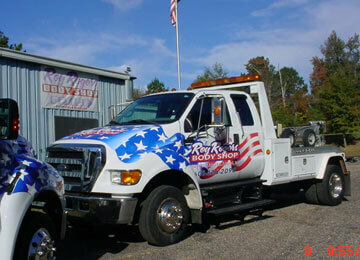 You can rely on Roy Rogers Body Shop to provide tow truck service on command at any time of day or night. Wherever you and your vehicle have been stranded, we can be there to pick you up. Local and long distance towing makes us the preferred option for all towing service needs throughout Jones County. Give us a call today at 601-778-4110 if you need any of our towing services.